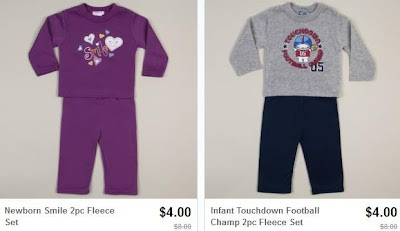 2pc Outfits for Baby only $4 + Possible FREE Shipping! Wow, head over to Totsy to find adorable infant 2-piece fleece outfits for only $4! There's also 3-piece sets for $7 and a few Disney outfits for $8. If you're expecting or know someone who is, this is a great chance to get some clothes shopping done for the new arrival! Even better, you'll get FREE shipping if this is your first order!